Motorcycles have been produced in myriad different models for innumerable purposes. This page is concerned primarily with contemporary designs of motorcycle. Road motorcycles are motorcycles designed for being ridden on paved roads. They feature smooth tires with a light tread pattern and engines generally in the 125 cc and over range. Most are capable of speeds up to 100 mph (~160 km/h), and many of speeds in excess of 125 mph (~200 km/h). In India and Pakistan, motorcycles are more popular than cars as means of transport due to cost of ownership. Typical displacements are small (50 to 350 cc), and as a result these motorcycles give better fuel economy — reportedly 40-80 km/L (94-188 mpg) being common. Road motorcycles are themselves broken down into several sub-categories. These motorcycles mimic the style of American machines from the 1930s to the early 1960s, such as those made by Harley-Davidson, Indian, Excelsior and Henderson, even though they have benefited from advances in metallurgy and design. The riding position places the feet forward and the hands up, with the spine erect or leaning back slightly, which many find to be more comfortable for long-distance riding. The riding position of American style Cruisers and Choppers evolved from the saddle and riding position used by Western Cowboys. This position allows greater long distance comfort, with some compromise of control. Chopper-style motorcycles would be categorized as a type of cruiser. Some cruisers may have limited performance and turning ability because of a low slung design. Riders who enjoy cornering at higher speeds may need to customize to enhance lean angle, or start with a performance or sport-cruiser. Cruisers are often custom projects that result in a bike modified to suit the owner's ideals, and as such are a source of pride and accomplishment. Cruisers are sometimes called custom even in the absence of aftermarket modifications (see Custom (motorcycle)). Sportbikes, sometimes called performance bikes, are typically much smaller and lighter than cruisers, and are essentially consumer versions of the motorcycles used in motorcycle racing, which they are generally only a few years behind in technology. The meaning of the term "Superbike" has changed over time since it was coined to describe Honda's CB750 of 1969. Nowadays the definition is drawn from the production racing series, World Superbike where engines are limited to 1000cc. The term "Supersport" is also derived from racing with a 600cc limit for four cylinder engines and a 750cc limit for twins. The riding position places the feet towards the back, the hands low and the spine inclined forward. Sportbikes derive their seating position from sporting oriented horse riding, notably the English Saddle. Sportbikes are almost invariably capable of very high speeds as compared to most vehicles, with great stability in corners. 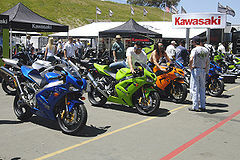 Large-displacement sports bikes offer large power-to-weight ratio with explosive acceleration; most bikes reach 100 km/h from stand still at or about 3 seconds and can do a quarter mile under or about 10 seconds. They are difficult to manage by those not experienced in their operation; for the less-experienced or who have requirements of a smaller, lighter vehicle, smaller-displacement, sub-75 horsepower (56 kW) motorcycles are also manufactured. The 2006 Kawasaki Ninja ZX-14 (stock) can reach 100 km/h (62 mph) under 2.5 seconds and does a quarter mile in 9 seconds flat with an experienced rider, however top speed is restricted to 300 km/h (186 mph).The many engine-sizes available often reflect the difference professional and amateur racing classes which adhere to strict engine-size and weight rules. The late 1990s saw "power wars" between various motorcycle manufacturers that culminated in Suzuki's 1300 cc GSX-1300R Hayabusa, the first production motorcycle to exceed 300 km/h (186 mph) , and Kawasaki's ZX-12R, designed to exceed 320 km/h (200 mph). The Japanese manufacturers have allegedly had "gentlemen's agreements" to limit production motorcycle engines to a maximum output of 125bhp in the 90s & later a maximum speed of 300 km/h (186 mph) in an effort to promote safety - typically accomplished with an electronically-controlled speed governor. Aftermarket manufacturers, however, do not hesitate to satisfy the need for even greater speeds - several produce parts or systems designed to defeat the factory-installed speed limits. Although any motorcycle can be so equipped and used to tour with, manufacturers have brought specific models designed to address the particular needs of long-distance touring and heavy commuting riders to market. Common to the touring market is usually large displacement fairings and windshields (to offer a high degree of weather and wind protection), large capacity fuel tanks (for long ranges between fill-ups) and a more relaxed, more upright seating position than sport-bikes. These motorcycles can be further subdivided into multiple sub-categories, which are commonly used terms within the motorcycle industry. Full-Dress touring motorcycles are generally characterized by extremely large fairings and bodywork compared to other forms of tourers, the integration of hard luggage into the design of the motorcycle (often including both saddlebags and a top-mounted box), very large displacement, torque-rich engines, and a very upright, comfortable riding position. Additionally, standard and optional amenities on full-dress tourers often encompasses equipment not normally offered on other motorcycles, such as complete stereos (AM/FM plus CD or cassette is standard, and now satellite radio is becoming more common), heated seats and hand-grips, GPS navigation systems, selective venting, power windshields, electrically controllable windshield, and for certain models in certain model-years, such oddities as integrated air compressors, air conditioning and air bags. Full-dress tourers are designed specifically for riding on pavement, although they may be taken onto hard, compacted dirt roads; they are specifically not designed for off-road duties. Debatably, the title of the original Full-dress production tourer was the BMW R100RT, introduced in 1978. Common current examples of full-dress tourers include the Honda Goldwing, the BMW K1200LT and the Harley-Davidson Electra-Glide, all of which have become increasingly popular. Standard tourers normally offer fewer amenties and less weight than full dress tourers, but still are designed with the primary task of laying back miles over pavement in comfort. Notable current examples include the Honda ST1300 and the Yamaha FJR1300. This category encompasses motorcycles designed specifically to provide global touring capabilities on both pavement and off-road with the intent of making virtually any destination reachable. Motorcycles in this category share an unique combination of traits that provide them very high ground clearance (for off-road purposes), particularly large fuel reserves, large displacement understressed engines for high reliability and heavy torque output, large size and good high-speed highway behavior & handling. This combination of traits (and their weight) is also what separates them from traditional off-road, enduro and MX class motorcycles. It is common for a large selection of purpose-driven options to be available for global tourers, including skid plates (to protect the engine and transmission during off-road use), larger and additional fuel tanks than stock, metal-formed hard luggage for extreme condition use, hardened GPS naviation systems designed to handle off-road abuse, etc. These bikes do not necessarily ship with hard luggage, but usually offer them as optional extras either from the manufacturer or via third-party suppliers. These motorcycles are often used as the basis for competitions in extreme rally events, including the grueling Paris-Dakar Rally. The global GS tourer was pioneered by the introduction in 1980 of the BMW Motorcycles R80 G/S, the first full mass-production motorcycle specifically designed for the task. G/S is the German abbreviation for Gelände/Straβe, meaning "off-road+street" use; the G/S name was later simplified to remove the slash. In the intervening years, BMW has upgraded their R80G/S through a number of models, and competitors have also delivered motorcycles designed to breach the same market niche with mixed success ( KTM is a good example of a successful competitor in the niche, although their primary competition to the current BMW R1150GS & R1200GS is not available in the USA as I write this). Noteworthy current examples include the BMW motorcycles F650GS, R1150GS & R1200GS, the KTM 990 Adventure series. Sport tourers are a hybrid form between sport bikes and tourers, allowing long-distance riding at higher speeds and with more emphasis on sport-like performance (in both handling and speed) than standard tourers; these bikes offer a mid-ground between both segments. The paradigm arguably originated with the 1976 BMW R100 RS, which combined BMW's traditional strengths for touring with a full-coverage racing fairing that entailed clip on-like handlebars and a semi-crouched riding position. The sport touring category includes such motorcycles as the Honda Interceptor, the Triumph Motorcycles Sprint & Sprint ST, Ducati Motor Holding Multistrada and ST series, (debatably) the Suzuki Katana (GSXF series), Honda VFR and ST series, several subsequent BMW models and (debatably) the Buell Ulysses. These bikes do not necessarily ship with hard luggage, but usually offer them as optional extras either from the manufacturer or via third-party suppliers. Common to the majority of the Sport-Tourer market is for the original manufacturer to utilize an existing engine and technology from the current or last generation of their sport bikes as a trickle-down effect (which is cost effective through reuse of existing tooling and parts), rather than building the engine design from scratch. As a result: Engine designs are usually modified from their sport-bike origins, typically being re-tuned and re-cammed (change of valve cam lift & duration) for an emphasis on greater mid-range torque rather than absolute peak horsepower. Additionally, it is common for certain rotating subcomponents such as crankshaft and flywheel to be replaced in the sport-tourer version of the engine with heavier replacements to accommodate smoother power delivery and potentially higher reliability factors. Larger fairings than are implimented on their sport-bikes are usually added for more rider protection from weather & wind. The frame is usually designed from scratch to provide a more upright/less aggressive riding position ("all day comfortable"). A longer wheelbase & more relaxed steering angle are usually also incorporated (both of which provide more straight-lines stability than their sport bike origins, but not to the degree that most pure "Tourers" do). The addition of these heavier parts (full fairings, longer frames, heavier engine components) also serve to increase the sprung weight of the motorcycle, which increases the sprung-vs-unsprung weight ratios, giving the bikes smoother riding characteristics over poor surfaces than the sporting motorcycles they usually derive from. Finally, ground clearance is usually left fairly high, permitting more sport-like riding through non-linear roads than the pure tourer segment. Also known as the "naked" bike or "street" bike, this is the basic form of the motorcycle stripped down to its fundamental parts, with the front wheel visible from the rider's position. The emphasis is on functionality, performance and ergonomics rather than flashy body panels and exaggerated riding positions that are most common on sport bikes. This style of motorcycle saw a resurgence at the end of the 1990s, driven in large part by the European market, with many manufacturers releasing new models with minimal or no fairings. 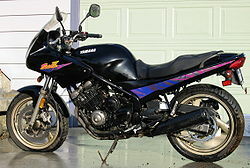 The Yamaha FZ1, Honda 919, Honda Hornet (599), and Suzuki GSF600 Bandit are popular examples of this style of motorcycle. Large engine displacement versions of the "naked" type of motorcycle, especially those built in Japan, are often referred to as "muscle" bikes. Motorscooters are similar to motorcycles and are also designed for being ridden on the road. Scooters have the engine as part of the swingarm, ie. their engines travel up & down with the suspension. They are often have smaller wheels (generally less than 14 in (357 mm) diameter), automatic transmissions, small (generally less than 125 cc) engines, and a step-through configuration allowing the rider to ride with both feet on a running-board and knees together. In Mediterranean Europe, particularly Italy, scooters are very popular. In the United States scooters have long been a fixture on college campuses and strapped to the back of Recreational Vehicles due to their portability and exceptional fuel economy. However much larger scooters with engine displacements greater than 250 cc are becoming more popular. The Honda Silver Wing, Honda Reflex, and Suzuki Burgman are the most popular "maxi-scooter" models available in the United States. The moped is a hybrid between the bicycle and the motorcycle, equipped with a small engine (usually a small two-stroke engine up to 50 cc, but occasionally an electric motor) and a bicycle drivetrain, and motive power can be supplied by the engine, the rider, or both. In many localities, mopeds are subject to less stringent licensing than bikes with larger engines and are popular as very cheap motorbikes, with the pedals seeing next to no use. 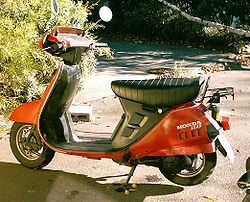 Mopeds were very popular in the United States during the late 1970's and early 1980's, but their popularity has fallen off sharply since the mid 1980's. These bikes are designed to be ridden through rough and muddy terrain. The types of off-road motorbikes include single-cylinder two-strokes and single-cylinder four-strokes in both air- and water-cooled varieties. The four-strokes are starting to take hold of this category, purely because of their fuel efficiency and their reliability. Typical engine sizes range from 50 cc to 150 cc (for young riders), 250 cc, 400 cc and 650 cc (for older riders). These bikes are commonly referred to as dirtbikes, and many people ride them simply for fun and recreation. They can also be optimized for various competitive sports: motocross, enduros, and time or speed trials. Trials bikes are a special subset of off-road bikes. They are very small (no more than 250 cc), and very light (often having no seat). They are used in motorcycle trials. Related to dirt bikes are "dual-sport" or "on-off road" bikes which are street legal variants of dirt bikes with more suspension travel than a standard bike but having all the other equipment usually found on one. These bikes are frequently quite similar to enduro bikes. These adaptations of trail bikes were first used by dairy farmers in New Zealand from the early 1960s. They wanted a light, simple machine that could be started easily and that would negotiate particularly muddy paddocks and steep hillsides in all weathers. A range of bikes were tried by a number of farmers and they came to use a mild-off-road machine that could carry a good load (mainly a tray for their dogs, instead of a rear seat) that was easy to mount, start and ride with heavy rainwear. Large profile low-pressure tires with knobbly tread were found best for grass, mud and rocky tracks. Ultimately Japanese manufacturers developed a range of specialised bikes—about the time that the farmers came to use ATVs instead. A Derny is a specialized type of motorcycle that is designed and built for use in track cycling events where a derny driver blocks the air-resistance for a racing bicycle riding close behind the derny. Although there are aftermarket trailers that allow motorcycle to tow, factory-made motorcycles specialized for towing are rare. The only known vehicle for towing is Retriever by a Swedish company named Coming Through, which is a modified version of Honda GL 1800 GoldWing. With the use of a high torque engine, low centre of gravity design, and retractable trailer, towing motorcycles can reduce response time for retrieving cars and light trucks on congested roads. Concept bikes are one-off motorcycles built as prototypes to test or showcase the desirability of a design, the integration of new technologies, cost effectiveness, or general design studies. Most concept bikes never see the light of day as full mass-production vehicles; those that do rarely match the original concept perfectly, instead representing a combination of some of the concepts presented in the proto-type combined with marketing realities and tooling capabilities of the manufacturer. Examples of recent concept bikes can be see in the press release for any of the major global motorcycle exhibitions, including the Tokyo Motorcycle Show, the various primary European Motorcycle Shows (InterMot,Paris Motorcycle Exhibit, Milan Motorcycle Show). This page was last edited on 28 November 2010, at 15:52.